Thanks to being huge Malaysia fans and huge Air Asia fans, we often find ourselves stopping over in Kuala Lumpur. Sometimes, we make it a longer break and journey to Kuala Lumpur or Port Dickson. Other times, we just have one night and the distance between the airport and Kuala Lumpur itself makes it much easier and preferable to stay at one of the KLIA and KLIA2 airport options. And if you have just one night, we recommend the same. 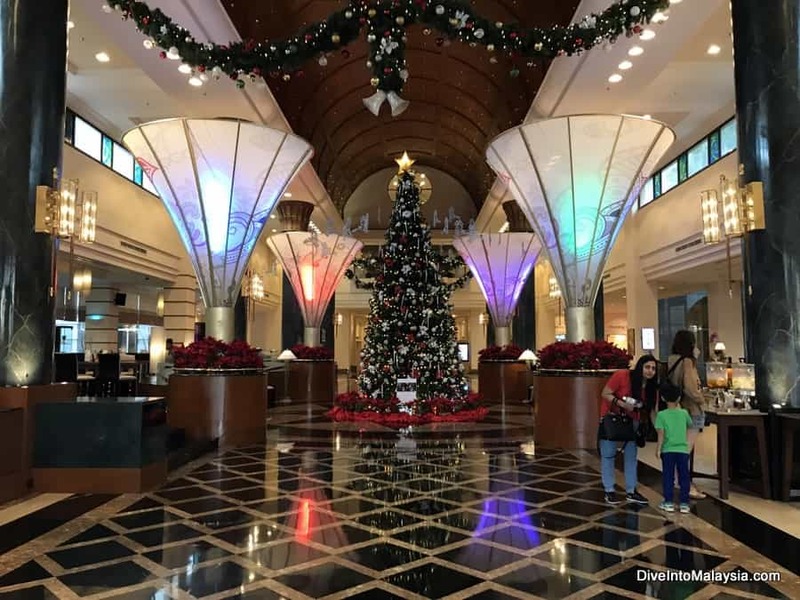 This stopover, we had just one night but it was long enough that it was worth the three-minute journey from KLIA2 to KLIA to stay at the best KLIA hotel option – the Sama Sama Hotel KLIA. Note: There are two Kuala Lumpur airport options (KLIA – sometimes KLIA1 – or KLIA2) which are separated by a seven-minute car drive or a three-minute rail journey. It can be easiest to stay at the terminal you are flying in and out of but it’s not a big deal to get to the other either – more information below! If you are just looking for a lounge or short rest at KLIA2 then check out this article. The Sama Sama Hotel Kuala Lumpur Airport is the premium choice for a great hotel with great facilities. There are 442 rooms and suites on offer. We found it the perfect place to break our journey between Australia and Cambodia with the chance to get a great night’s sleep in a good room with some great facilities – like the chance to relax in a pool between flights. Below, we show you our room, the facilities, the food, how to get here and more. We think you can find it a great choice too! Click here to see the latest prices of the Sama Sama Airport Hotel KL! 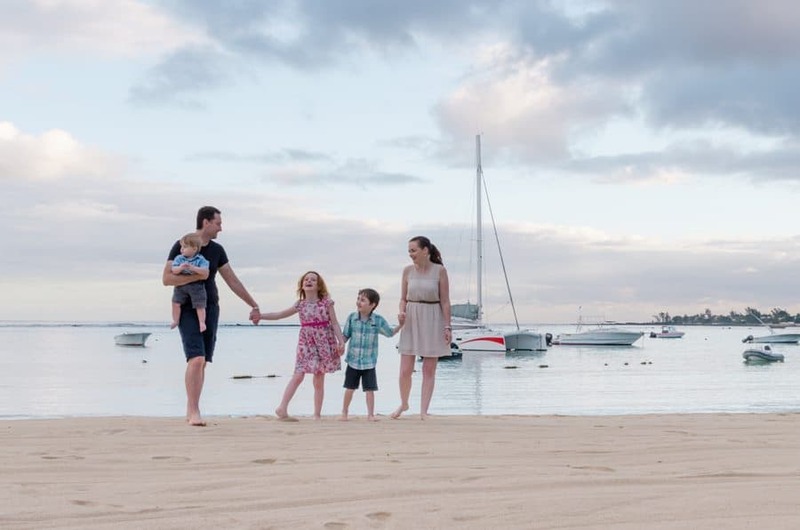 We stayed here with our family of five – two adults and three kids aged 2, 6 and 8. 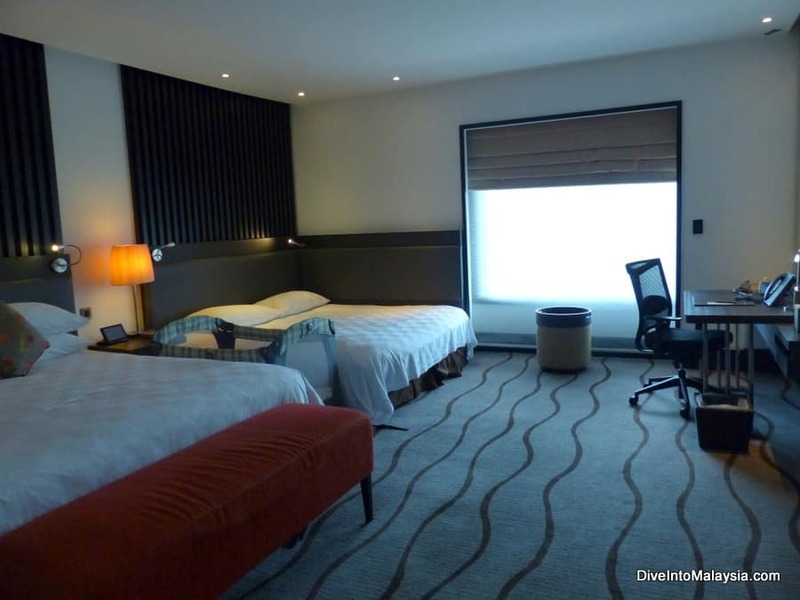 There are a range of room types at the Sama Sama Hotel Kuala Lumpur International Airport which was part of the appeal for us as there are family rooms. All rooms come with the standard LCD TV, telephone, in-room safe, coffe and tea making facilities, mini bar, iron and ironing board and internet. Our Sama Sama hotel family room had a king bed and Hollywood twin beds (which is two single beds right next to each other). There are also some nice touches – like their was an airport themed game for the kids to play and colouring book and pencils. If you are not a family, there are also plenty of other options including the magnificent Presidential Suite. With 153sqm of floor space, this Suite has a separate living Room, dining room and access to the Premier Lounge. Many other luxury room and Sama Sama suite types also have access to the Premier Lounge where you can get extras like a buffet breakfast and pre-dinner cocktails. Click here to see more room options and make a Sama Sama Hotel booking. To be honest, the main reason we booked this hotel was the Sama Sama Hotel swimming pool. I know we always feel better after an airport stopover where we can relax and exercise in a swimming pool. It doesn’t just feel better for our bodies but also our minds – more like we are on holiday already and less like we are in the middle of a longer journey. The swimming pool here did not disappoint. It’s a lovely area and any photo I have see of it (including my own!) do not do it justice. It’s surrounded by greenery and the pools are a great size. It really does not feel like you are next to a major airport at all. 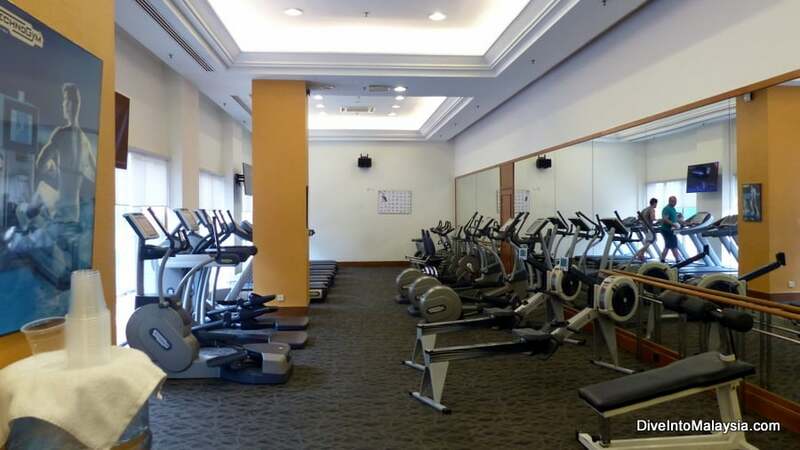 Other facilities include a 24-Hour Health Club which has a gym, jacuzzi, sauna and tennis court. This is also where you can find the Sama Sama Hotel Spa and you can have a relaxing massage. You won’t go hungry here with four easy dining options and a variety of cuisines so everyone is catered to. You can also get room service so you can eat any time of day! And if you have Premier Room access, you can have breakfast there. There is the Degrees Restuarant which serves breakfast, lunch and dinner Sama Sama Hotel buffet style as well as a special brunch on Sunday. They advertise 180 eating options from around the world and you can chat to the chefs as they prepare your meal. The Traveller’s Bar and Grill is open for a great dinner, and also features live entertainment and dart games until late. There is also the Palmz Lounge which is perfect for a drink and a late snack. It’s also home to airport departure screens so you can relax here easily before checking in to your flight. Finally, you can also have a drink and snack right by the pool at the Pool Terrace Cafe which is open all day and into the evening. There is also the option to dine at the airport. This is a short walk or buggy ride where you can find a food court and other options without checking in. It is very easy to get to this hotel. The Sama Sama Hotel location is perfect! If you are flying into KLIA, the hotel is a simple five-minute walk from the arrival hall or you can take a complimentary two-minute buggy ride via the undercover sky bridge. Simply get down to level 2 in the airport and there are many signs to point you in the right direction to the hotel once you are on this level. The buggy ride is part of the fun of staying here to me. It’s really easy and they run whenever you need them. There is a huge wall mural that you really can’t miss where you catch it. They go quite fast which gives a nice breeze compared to the hot walk over. There is even the option to check-in before leaving the arrivals hall with a hotel check-in counter located at carousel F of the baggage claim area. If you are coming here from KL, KLIA2 or elsewhere, you can take the airport express train. It’s a simple elevator ride up one level and you’ll be right near the buggy service pictured above. From KLIA2, you can catch the train easily to this buggy service. Simply go to the train station for the KLIA Express where you can buy a ticket to catch a train just to KLIA for MYR2 for adults or 1 for kids.The train is just three minutes and runs regularly. It is easy to take your luggage and the staff are helpful if you are at all confused. You can read full details of how to transfer between KLIA2 and KLIA here. Once you arrive at the hotel, check in is quick and easy and there is juice and water available so you can sit back and have a refreshing drink before going to your room. There are a few SamaSama Hotel KLIA options so don’t get confused. The big thing that differentiates this from the other two options is that it’s called Sama Sama Hotel KL International Airport rather than Sama Sama Express. 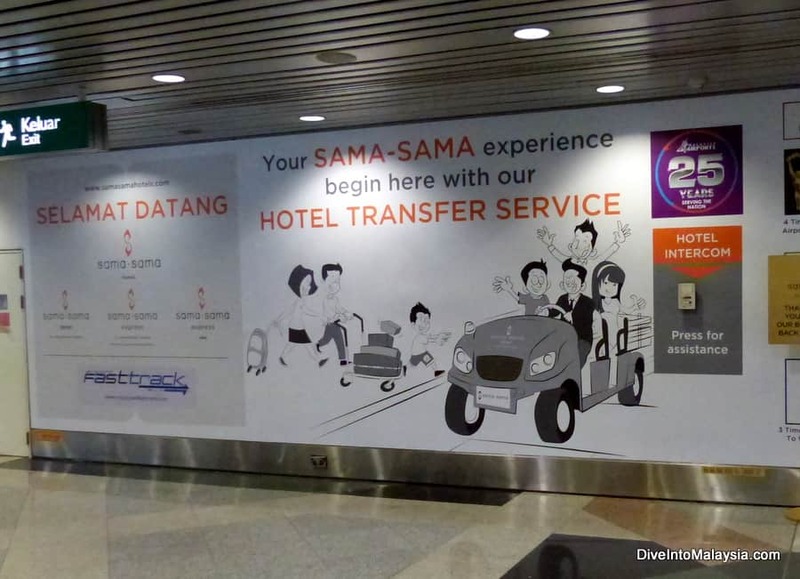 There are Sama Sama Express options inside each of the main KLIA terminals. The Sama Sama KLIA Express options are if you have a shorter transit and don’t want to clear customs. Otherwise, you should definitely head to this Sama Sama Kuala Lumpur Airport which is bigger and nicer with better facilities. The Sama Sama Kuala Lumpur International Airport is a great choice if you are transiting. It’s a great hotel with nice rooms, many options and some nice facilities like a pool. If you have more than one night, I do recommend exploring KL or Port Dickson. But, with one night, this is the perfect place to break a journey. We were really impressed by this hotel. How easy it is, how lovely and what a high standard it is. And the pool area is just brilliant. It is definitely worth the short journey over from KLIA2 as it is much better than the Tunes Hotel and didn’t cost much more for us. Looking for a hotel at KLIA2? 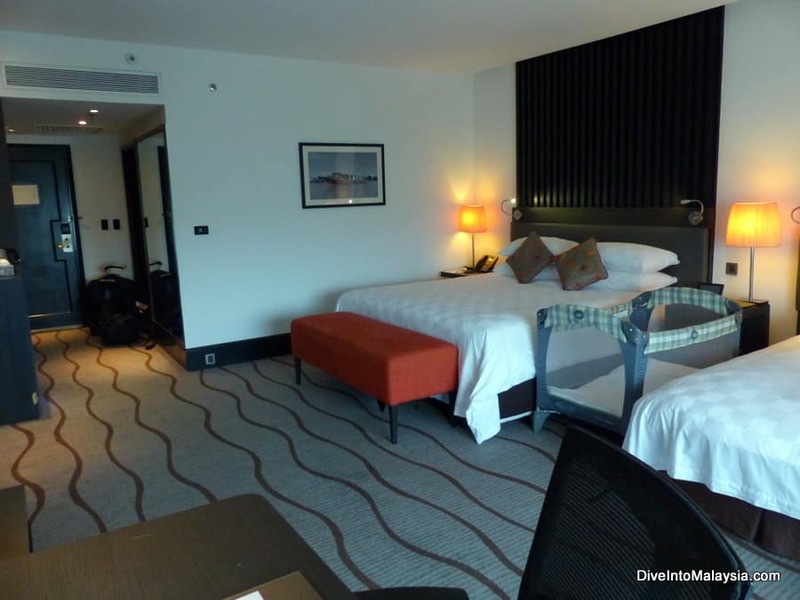 Then read our Tune Hotel KLIA2 review. For full information about travelling between KLIA and KLIA2, KL Airport’s two terminals, click here. For more information about stopping over at KLIA, read our full guide here.